At the risk of getting Inside Baseball on you, I want to call out something first brought to my attention in the most recent episode of “PNR: This Old Marketing.” That something is a debate by the show’s hosts Joe Pulizzi and Robert Rose over the meanings of “content marketing” vs. “content strategy,” inspired by the use of these terms in a new free online class from Northwestern University on content strategy. Sadly, the Northwestern class, like too many people in my profession, uses the terms interchangeably. As Joe and Robert correctly explain (in the last 10 min. of the show, starting at 42:00), the distinction is subtle, but it’s important not to use these terms interchangeably. They do have separate, widely (mis)understood meanings. Though these terms are abstract, I’m going to try make them easy to digest. Content strategy is generally more about plotting the entire user experience, information architecture, and utility of content. 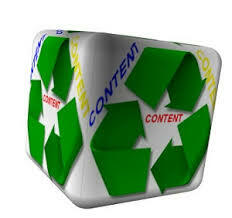 Content marketing, on the other hand, represents the creation and placement/promotion (i.e., marketing) of specific content, usually of the instructive, helpful type that does not directly promote a product/service. For example, company websites are often designed according to a content strategy based on the goals of its various audiences. The specific output companies produce (quintessential example: Red Bull) and promote on their websites and elsewhere could be examples of content marketing. As long as the goal is to interest, educate or guide customers without a product-focused or hard-sell approach, you could probably call it content marketingat least under its broadest definition. However, any great content that is not easily accessible fails from a business perspective. How? The key word that defines content strategy (apart from its marketing sister) is “usable.” My old college classmate and fellow marketing comrade DJ Francis puts it best in a video (above) where he brilliantly describes content strategy with Post-it notes as the forward-looking creation of “useful, usable and desirable” content alongside the design and architecture to support it. In other words, true content strategy suggests content is not just something to toss in on top of a design, but rather, central to its very creation. The content informs the design, or at least develops alongside it, not stamped on as an afterthought. In this sense, the “usability” is integral to the difference between these two terms, because content strategy as a discipline concerns itself broadly with the user experience and users’ ideal actions in a business context. So, don’t be confused anymore if somebody starts throwing these popular terms at you, especially if it’s a recent graduate of this Northwestern course. Or, at the very least, you know which site to go to if you want the perfect DIY faux hawk.